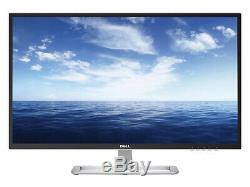 Dell D3218HN 32 1920x1080 Full HD WLED Ultra-Wide IPS LCD Display Panel Monitor X9R5K 0X9R5K CN-0X9R5K. NEW - IN ORIGINAL MANUFACTURERS SEALED RETAIL BOX! Get a great viewing experience at a superb value with the stylish Dell 32 Monitor, Full HD 1920 x 1080 resolution, and vibrant colors across an ultra-wide 178°/178° viewing angle. Choose the Dell 32 Monitor which comes with efficient features that meet your computing needs. Featuring an elegant design that adds modern style to your desktop, the Dell D3218HN is a 32-inch monitor ideal for work and entertainment. It utilizes IPS technology, high contrast, and outstanding brightness to let you enjoy beautiful images with vibrant color and excellent clarity, no matter what angle you're viewing from. Its VGA and HDMI ports ensure compatibility with both new and legacy devices. Dell Part Number: X9R5K 0X9R5K CN-0X9R5K Model Number: D3218HN. 1x Monitor 1x Stand 1x VGA Cable 1x Power Cord. Designed to Delight Expand your enjoyment: The thin bezels let you enjoy the stunning screen with less distraction. Made to fit in and stand out: Complement your desk with a modern design in premium white finish. From the striking 31.5 screen to the elegant matte back cover, every inch was designed with style in mind. We take pride in our unyielding commitment to quality and the utmost satisfaction of our customers. Color Your World A beautiful view: Experience the excellent screen clarity that comes with Full HD (1920x1080) resolution. Consistent and rich colors: A wide viewing angle enabled by In-plane switching technology lets you see vibrant colors no matter where you sit. Scroll Down/ Decrease/ Contrast/Brightness menu 3. Scroll Up/ Increase/ Color Vision Mode select 4. Confirm Select/ Input Select 5. Model number D3218HN Viewable image size (diagonal) 80.0cm (31.5 inches) Active display area Horizontal: 698.40mm (27.49 inches) Vertical: 392.85mm (15.46 inches) Maximum resolution 1920 x 1080 at 60 Hz Aspect ratio 16:9 Pixel pitch 0.364 mm Brightness (typical) 300 cd/m² Color gamut (typical) 84% Color depth 16.7 million colors Contrast ratio (typical) 1200:1 Dynamic Contrast Ratio 4 Million:1 Viewing angle (typical) 178° Horizontal / 178° Vertical Response time (typical) 8 ms (white to black, black to white) Panel technology, surface In-Plane Switching type, glossy Backlight White LED Bezel color White Connectors VGA, HDMI Video Cable in box VGA Dell soundbar (optional) None Remote asset management N.
If you ordered on Saturday or Sunday. The advertisement of any product does not constitute an offer to sell. Your order does not signify our acceptance of your order, nor does it constitute confirmation of our offer to sell. We reserve the right to accept or decline your order. Ambiguity: In the event that something may seem ambiguous to you or you think we made a typo or a mistake. This agreement shall be construed under and in accordance with the laws of the state of Ohio, and all obligations of the Parties created in this Agreement are performable in Lake County, Ohio, United States of America. You may only place your order if you have read and agreed to these terms. Powered by SixBit's eCommerce Solution. The item "DELL D3218HN 32 1920X1080 FULL HD WLED ULTRA-WIDE IPS LCD DISPLAY MONITOR X9R5K" is in sale since Friday, March 22, 2019. This item is in the category "Computers/Tablets & Networking\Monitors, Projectors & Accs\Monitors". The seller is "ascendtech" and is located in Cleveland, Ohio. This item can be shipped to United States, Canada, United Kingdom, Denmark, Romania, Slovakia, Bulgaria, Czech republic, Finland, Hungary, Latvia, Lithuania, Malta, Estonia, Australia, Greece, Portugal, Cyprus, Slovenia, Japan, Sweden, South Korea, Indonesia, Taiwan, South africa, Thailand, Belgium, France, Hong Kong, Ireland, Netherlands, Poland, Spain, Italy, Germany, Austria, Bahamas, Israel, Mexico, New Zealand, Philippines, Singapore, Switzerland, Norway, Saudi arabia, Ukraine, United arab emirates, Qatar, Kuwait, Bahrain, Croatia, Costa rica, Dominican republic, Antigua and barbuda, Aruba, Belize, Dominica, Grenada, Saint kitts and nevis, Saint lucia, Turks and caicos islands, Barbados, Bangladesh, Bermuda, Brunei darussalam, Bolivia, Egypt, Guadeloupe, Iceland, Jordan, Cambodia, Cayman islands, Sri lanka, Luxembourg, Monaco, Macao, Martinique, Maldives, Nicaragua, Oman, Peru, Pakistan, Paraguay, Viet nam, Uruguay.